The Securities and Exchange Commission began moving forward this week on its ambitions to craft a more business-friendly regulatory regime, starting with plans to exempt many more companies from compliance requirements and to cap potential rewards to whistleblowers. Most notable for ethics and compliance officers, the commissioners voted (along the predictable 3-2 partisan split, favoring Republicans) to propose capping whistleblower rewards at no more than $30 million. On the other hand, the proposal would also expand the potential for whistleblower awards at the bottom end of the scale, too. SEC chairman Jay Clayton said the current formula allowing the commission only to calculate whistleblower awards as a percentage of penalties the SEC recovers, rather than by dollar amounts, is “too rigid.” Capping awards at $30 million wouldn’t in practice hurt whistleblower incentives to come forward, he said. Since 2011 the SEC has given $266 million in awards to 55 whistleblowers. Within that amount are a handful of huge awards, including an $83 million award divided among three whistleblowers earlier this year. About 60 percent of the whistleblower awards have been less than $2 million. Clayton said there is no question the whistleblower program has made significant contributions in detecting wrongdoing and protecting the marketplace, and called it a “critical component in our investor protection toolbox.” The program has led to more than $1.4 billion in penalties collected, much of which went to repay harmed investors and then reverted to the U.S. Treasury. The Democratic commissioners objected to capping whistleblower awards. Robert Jackson said the proposal “risks harm by introducing uncertainty and politics” into potential awards, and might spook senior corporate executives who risk their jobs and careers to report misconduct. Stein also questioned whether the SEC even has discretion under the Dodd-Frank Act to apply a cap at all — possibly an invitation to investor advocates that they should consider challenging any final new rule in court. The SEC also proposed an amendment in response to the recent Supreme Court decision that whistleblowers don’t qualify for Dodd-Frank anti-retaliation protections unless they report violations to the commission first — which, shocker, has led to more allegations reported to the SEC. The amendments would require whistleblowers to report their allegations to the SEC in writing (via an online form) to receive protection from retaliation. Whistleblowers would also be barred from receiving multiple awards from separate programs for the same information. That is, no double-dipping allowed. New summary disposition procedures would also give SEC staff an easier path to deny whistleblower claims in cases involving untimely award applications, tips that weren’t submitted in the correct format, or tips that were not passed along to or used by staff in its investigation. Whistleblowers could still appeal the denial to the commission. The SEC also issued guidance on what constitutes independent analysis in the whistleblower rules: to qualify as independent analysis, the whistleblower’s submission has to provide evaluation, assessment, or insight beyond what would be readily apparent through public information. And for all you financial compliance junkies, the SEC also broadened the definition of “smaller reporting company” to increase the number of filers that would qualify for scaled disclosures. Translation: more companies eligible to report fewer details to investors. An estimated 966 companies will be able to take advantage of the changes in the first year. What benefits does scaled disclosure bring, exactly? 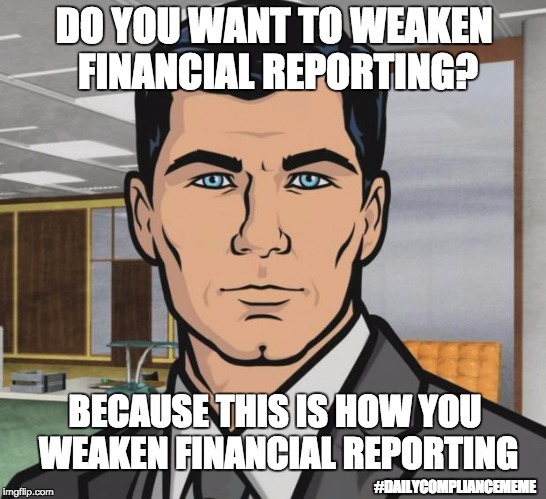 For starters, smaller reporting companies can report fewer details about executive compensation, and submit only two prior years of audited financial statements rather than three. Smaller reporting status does not mean the company is exempt from Section 404(b) of the Sarbanes-Oxley Act, which requires audits of financial reporting controls. The 404(b) exemption only applies to non-accelerated filers — and while some smaller reporting companies might also qualify as non-accelerated filers, not all do. Translation: a bigger effort to roll back Section 404(b) compliance, coming soon.